Viking Way to Valhalla info about the game-Games2Rule. Valhalla awaits your enemies in Viking: Way to Valhalla! 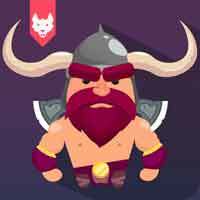 Published by CrazyGames, this highly addicting, match two battle game places you in the role of a Viking protecting your village and trying to save your woman! Available on both desktop and mobile, you have to match symbols of the same color to create another one and match swords to execute an attack to shut down your enemy. Use tactics and forward thinking strategies to defeat your enemies and save your people! Will you prove your worth in battle or will you end up in Valhalla, defeated?